A magnificent sunrise this morning from our lanai, a real "Oh my God" moment. Thank you Lord! 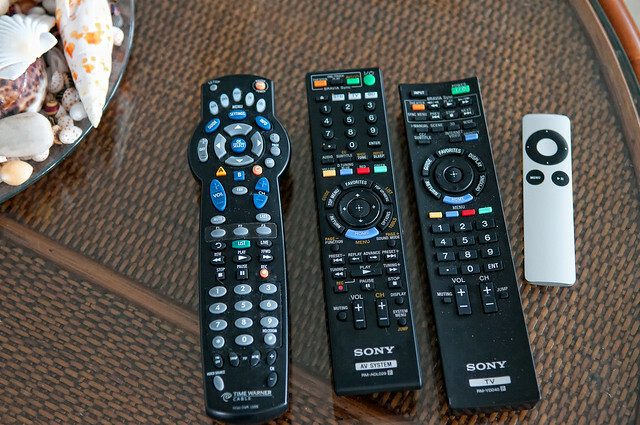 Four remotes when all you want to do is watch TV! Evelyn stopped talking to me when she saw these remotes as she settled in the couch to watch her "Dancing With The Stars" show in surround sound. The screen went blank....with the first remote she touched. Hahaha! Can't blame her. I get totally perplexed every now and then each time I picked up the wrong device. There is a way to sync all four into just one remote but after a couple of hours of following the endless prompts (can you believe that?) the newly "synchronized" remote was even more complicated!!!!!! I am hoping that Apple will someday get involved in this business so they can simplify things like the way they revolutionized the smartphones with the iPhone. This complexed set up has not changed since the intro of the VCR ages ago. !